Need a quick dinner recipe? 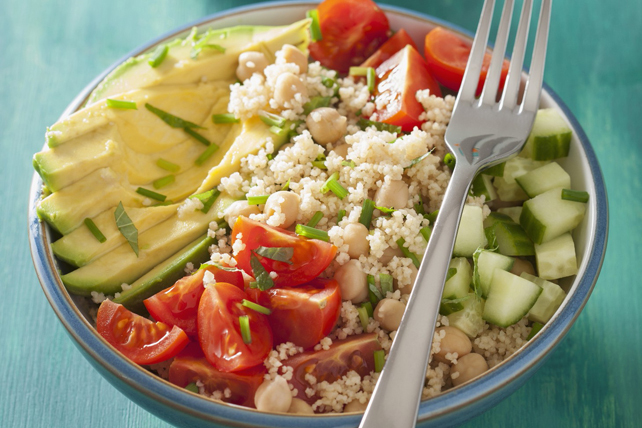 Our Couscous and Chickpea Veggie Bowl features cut-up fresh tomatoes, cucumbers, avocados and chives - all drizzled with our zesty lime dressing for the perfect finishing touch. Spoon couscous into 2 serving bowls. Top with all remaining ingredients except dressing. Top each serving with 1/4 cup Cracker Barrel Crumbled Feta Cheese with Oregano, Sun Dried Tomatoes and Black Pepper.